Two Russian cosmonauts ventured outside the International Space Station (ISS) on Thursday in order to conduct a Russian spacewalk, known by its official designation of Russian EVA-30. The six hours, 15 minute spacewalk, the first since August last year, included the relocation of external hardware between modules, while the installation of debris panels will now take place on a later EVA. 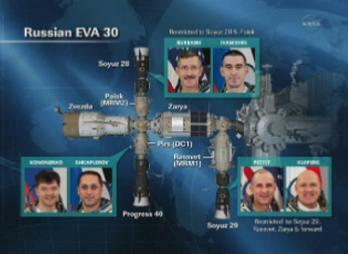 Following suit-up activities from 12:20 to 12:40 PM GMT, Russian EVA-30 got underway at 2:31 PM GMT, when the hatch of the Docking Compartment-1 (DC-1) “Pirs” airlock was opened to the vacuum of space. The EVA crew consisted of Russian cosmonauts Oleg Kononenko, designated EV-1, and Anton Shkaplerov, designated EV-2. Both were wearing Russian Orlan-MK spacesuits marked with blue stripes, with Kononenko wearing Orlan-MK #4, and Shkaplerov wearing Orlan-MK #6 – on what was the 162nd spacewalk in support of ISS assembly and maintenance. Kononenko, who has been on the ISS since late December, conducted two EVAs during his previous station flight, Expedition 17 in 2008. Shkaplerov, who has been on the ISS since mid-November, was making his first ever venture outside the station. 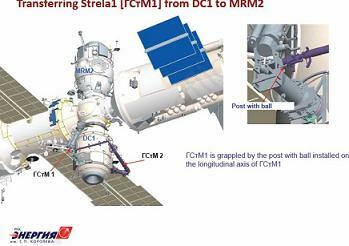 The main objective of the EVA was to relocate the Strela-1 crane from its current location outside DC-1 to its new home outside Mini Research Module-2 (MRM-2) “Poisk”. This task was originally scheduled to be performed during Russian EVA-29 in August last year, but was deferred due to time constraints associated with other EVA tasks. There are two Strela cranes on the ISS, one of which was launched on the Space Shuttle early in the ISS’ lifetime, and the other was launched inside DC-1 itself. They are a basic Russian equivalent of the station’s robot arm, and are used to manoeuvre large pieces of equipment around outside the Russian Segment (RS) of the ISS. Unlike the Space Station Remote Manipulator System (SSRMS) however, they are operated by spacewalkers outside the station, rather than from a console inside the station. 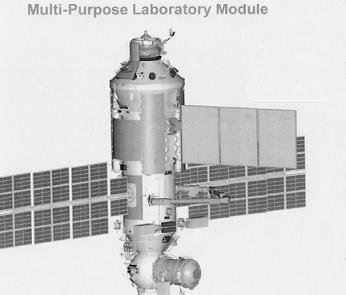 The Strela-1 relocation was necessitated by the arrival next year of the newest Russian module for the ISS, the Multipurpose Laboratory Module (MLM) “Nauka”, at the docking port where DC-1 currently resides (Service Module Nadir). This means that DC-1 must be undocked prior to MLM’s arrival, and so both Strela cranes, and an EVA support ladder, must be relocated from DC-1 in order to preserve them for future use. While this EVA saw the Strela-1 relocated to MRM-2, Russian EVA-31 in August this year will see Strela-2 relocated from DC-1 to the Functional Cargo Block (FGB), attached via the Strela adapter that was installed onto the FGB Flight Releasable Grapple Fixture (FRGF) following its relocation from a Pressurised Mating Adapter-3 (PMA-3) FRGF by the STS-133 EVA crew in February last year. The FGB FRGF was the fixture which the Shuttle Remote Manipulator System (SRMS) grappled back on the STS-88 mission in 1998, enabling the FGB to be docked to PMA-1/Node 1, and thus enabling the first “handshake” between Russian and American ISS hardware in space. 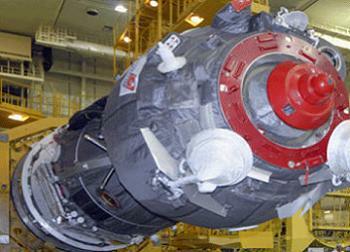 The MLM launch atop a Russian Proton booster and docking to the ISS are currently scheduled for June and July 2013. Assuming this timeline holds, DC-1 will be undocked from the ISS following a successful MLM launch (not before, in case an MLM launch failure leaves no module at SM Nadir). As currently scheduled, this will be performed by the Progress M-20M spacecraft, which will dock to DC-1 Nadir in April 2013, and will be used to guide DC-1 away from the ISS following its undocking, for a later de-orbit. Following the DC-1/Progress M-20M undocking, the MLM will then dock to the SM Nadir port under its own power. Once docked, the MLM will provide dedicated research capabilities to the Russian Segment, including an experiment airlock and European Robotic Arm (ERA) for external research, and also an additional sleep station, thus increasing the ISS’ living accommodation from its current six crewmembers, to seven. 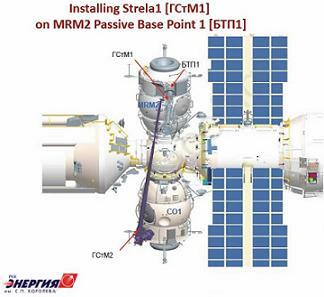 When coupled with the two sleep station “kayutas” in the SM, the MLM will allow all three Russian crewmembers to seep in their own segment, meaning a sleep station will be freed up in the US Segment of the station. This will allow for a four-person crew in the US Segment of the station, something NASA is actively looking to provide once the commercial crew provides come online with their additional seats. With three Russian, three American, and one international astronaut aboard the ISS as was originally envisioned, more crew hours will be available for research activities, especially when coupled with a then operational Robonaut 2 (R2), which just yesterday completed its initial checkout activities aboard the ISS, culminating in the first ever human-humanoid handshake in space between R2 and ISS Commander Dan Burbank. Following the Strela-1 relocation to MRM-2, which required the assistance of the Strela-2 crane still located on DC-1, the two spacewalkers were set to move onto installing five Service Module Debris Panels (SMDPs) on the SM small diameter segment (RO1) via attaching them to handrails, as analysis shows that the SM Micro Meteoroid Orbital Debris (MMOD) protection is weak in some areas. However, due to the extended time taken with the Strela cranes, this task will now be conducted on a later spacewalk. Several “get ahead” tasks were still conducted, mainly due to their location to the Strela worksite, which included the performing of the “TEST” experiment (two samplers) on the SM RO1, installing support struts for the EVA ladder on DC-1, and installing two “Vynoslivost” sample exposure panels on MRM-2. During the EVA, various crewmembers were isolated in different parts of the station, since the Service Module transfer compartment (PkhO) is located directly above the closed hatch to DC-1, which was depressurised during the EVA. Since the PkhO, which can also serve as an airlock, must be available as a back-up airlock in case DC-1 cannot be repressurised, all hatches leading to the PkhO remained closed during the EVA. As the PkhO is a four-way juncture between the SM working compartment, the FGB, DC-1, and MRM-2, the latter of which Soyuz TMA-22/28S is docked to, this means that the pathway to Soyuz TMA-22 and the rest of that station was blocked throughout the EVA. ISS flight rules state that all crewmembers inside the ISS must have access to their Soyuz spacecraft at all times should an emergency evacuation be required, and so this requires the Soyuz TMA-22 crew – consisting of ISS commander Dan Burbank and Russian Cosmonaut Anatoly Ivanishin, to be isolated inside MRM-2 (to which Soyuz TMA-22 is docked) throughout the EVA. Astronauts Don Pettit and André Kuipers had access to the entire station forward of the SM PkhO, as their Soyuz TMA-03M/29S is docked to MRM-1, which is in turn docked to FGB Nadir forward of the SM. As DC-1 was depressurised for the EVA, the hatches leading to the Progress M-14M/46P docked to DC-1 were closed, to prevent the depressurisation of the Progress. Following damage to the Descent Module (SA) intended for the Soyuz TMA-04M/30S spacecraft during a pressurisation recently, the Russian space agency, Roscosmos, made the decision to use the undamaged spacecraft intended for the Soyuz TMA-05M/31S flight for Soyuz TMA-04M. This means that there was insufficient time to ready the spacecraft in time for Soyuz TMA-04M’s original window, and so a delay of 45 days was called for the Soyuz TMA-04M launch, and subsequently, the Soyuz TMA-05M launch and Soyuz TMA-22 landing. However, as noted by NASA Human Exploration & Operations Mission Directorate (HEOMD) Associate Administrator Bill “Gerst” Gerstenmaier during the NASA FY2013 budget briefing on Monday, the Russians appear to be ahead of schedule in readying the spacecraft for launch, and thus are considering reducing the delays from 45 days to 30 days. L2 information shows that the Russians are currently in the process of considering moving the Soyuz TMA-04M launch, previously delayed from 30th March to 15th May, up to 30th April. This would move the Soyuz TMA-22 landing, previously delayed from 15th March to 30th April, to 15th April. It is unknown at this time whether the Soyuz TMA-05M launch, previously delayed from to 15th May to 1st July, could be moved up by a similar amount. Since the SpaceX COTS-2/COTS-3 (C2/C3) demo flight is currently pencilled in for late April, it is not yet known how any potential Soyuz manifest re-shuffles would affect this flight. All plans however are notional, and are unconfirmed at this time, as any changes to the complex ISS flight manifest must be worked with all the ISS international partners. (Images: Via NASA, Roscosmos and L2. As with all recent missions, L2 is providing full exclusive level mission coverage, available no where else on the internet.